QUAD BAND!! PLUS VERSION!! DUAL DISPLAY!! Why settle for two bands when you can have four? With the TYT TH-9800 Quad Band UHF/VHF mobile two way radio, now you can! 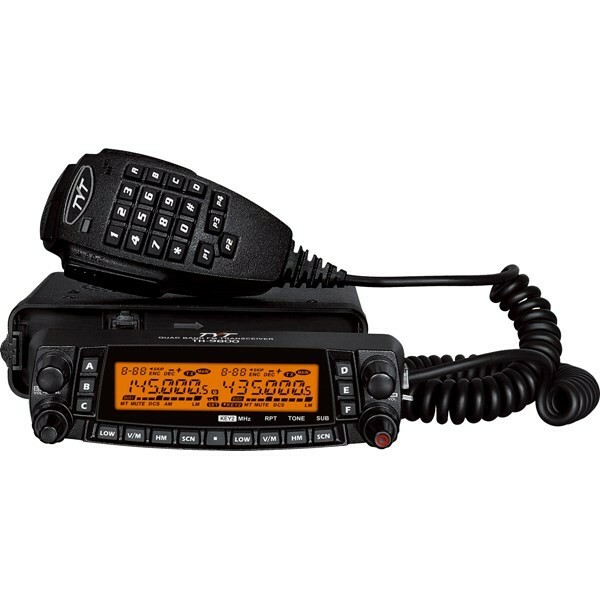 The TH-9800 is a powerful transceiver with the high end features you expect from a TYT mobile at a low end price. 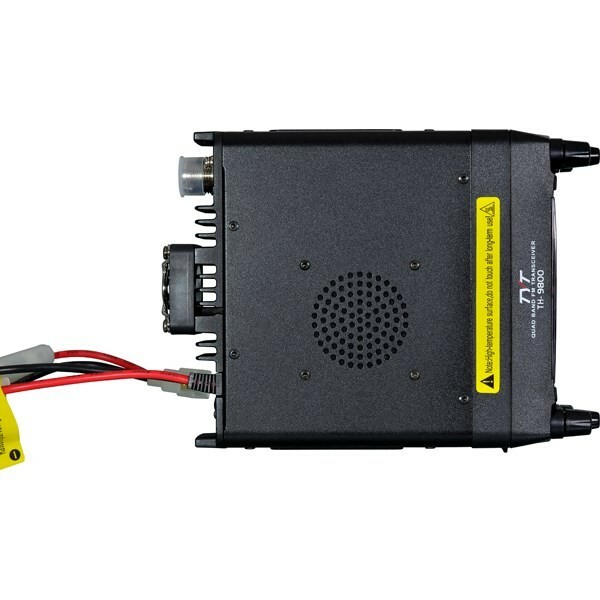 It covers 26-33 MHz, 47-54 MHz and 136-174MHz with 50 watts on VHF and 400-480MHz with 40 watts on UHF, to provide maximum power for mobile communications at a minimal cost. The TH-9800 gives you V/V, U/U and V/U simultaneous receive. It is also a V+U cross-band mobile repeater with full duplex capability. 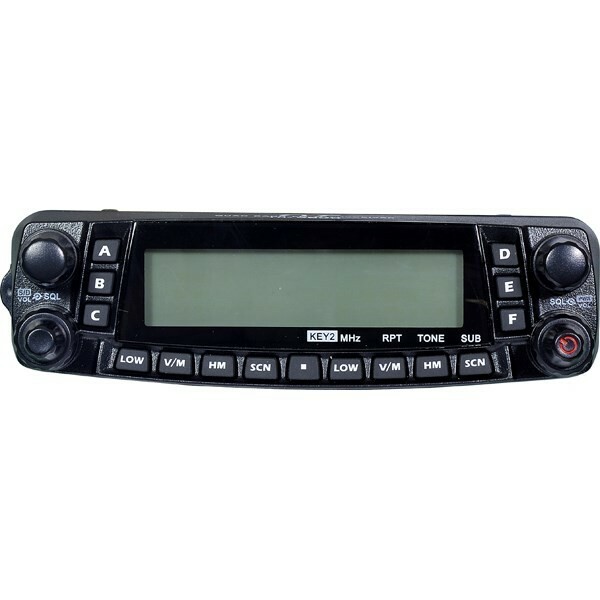 It has a built-in 76-108Mhz FM radio, 800 memory channels with independent settings for each channel, user defined CTCSS and DCS codes, and 8 group voice scrambler. It also features a built-in fan to keep things cool while in operation. The TH-9800 is loaded with extras, such as Automatic Repeater Shift (ARS), programmable memory scan, tone search scan, and DTMF signaling. It also includes Auto Range Transponder System (ARTS), a feature usually found on many Vertex Standard business radios. TYT also equipped the TH-9800 with the large, dual frequency LCD display found on many of their other mobiles, plus a full featured backlit DTMF keypad on the handheld microphone. The front panel is detachable and can be relocated separately from the radio chassis. The included extension cable allows you to install it just about anywhere in your vehicle so you can have it right where you need it. 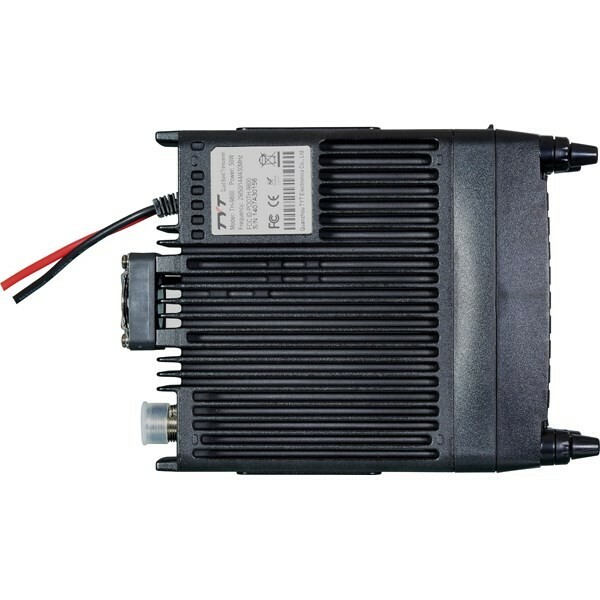 The TYT TH-9800 comes with hand microphone, detachable front panel, mobile mounting bracket, mobile power cord, extension cable, hand microphone hook, fuses, screw packs, an owner's manual and a one year manufacturer warranty from TYT. For your convenience, an optional USB programming cable (Model TYT-PROG-MBL) is available to program the TYT TH-9800 from a computer. Great radio. So I placed an SWR meter on it and with no other work, came out 1.2 and worked right out of box. Not bad... Even at 10m and 6m... Very cool. I was like WOW!... Nice. OK, this babe going in my truck. Since you're sold out, I plan on getting a few more... Get this radio but wait until I buy mine first. This is a nice little radio. Works great and price is good too. Got this for radio go box. Going to get one for car. I bought this, and connected it to a homebrew UHF/VHF antenna from QST in the 80's, and now my signal is coming through loud and clear (according to my fellow amateurs). Easy to set up and use, powerful amp. Would buy again. Ive had this radio for a few weeks now and I am very pleased. I use it on ham bands as well as gmrs. The output power is a few watts more than advertised which was unexpected but fine with me... hihi. I am going to buy another one for the xyl's vehicle. It is simple to program without software and easy to use. This radio is feature packed, and small in size. While this might not be the top quality of the major name brands, it has proved to be very versatile and dependable so far. This will be my second TH-9800. I have found that in addition to the VHF, UHF, 10M FM and 6M FM, it can operate very well on GMRS as well as other frequencies you might need depending on your occupation. It will also operate on FRS and MURS although it's minimum transmit power is 5w, a little more than allowed on those two bands. I have fabricated a bracket and wired up a 12V computer fan to aid in keeping mine cool when under heavy use and that seems to keep it happy. I have been pleased with this product. I use on ham&fire band,s excellent on both bands!! !